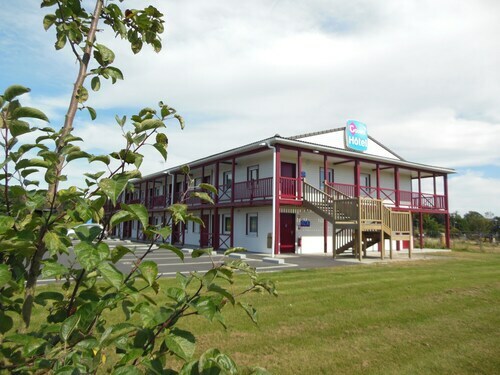 Situated in Loudeac, this hotel is within 1 mi (2 km) of Aquarev Park, Church of St Nicolas, and Palais des Congres. Chateau de Rohan and Lake Guerlédan are also within 20 mi (32 km). 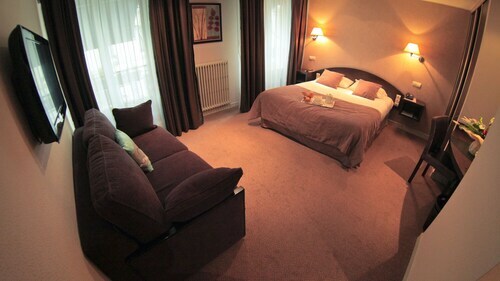 Located in the heart of Loudeac, this hotel is within a 15-minute walk of Church of St Nicolas and Palais des Congres. Aquarev Park is 1.4 mi (2.3 km) away. 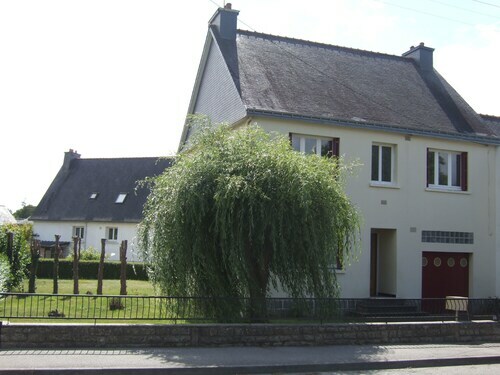 Situated in Loudeac, this vacation home is within 1 mi (2 km) of Palais des Congres and Church of St Nicolas. Aquarev Park is 2.3 mi (3.8 km) away. Situated in a rural location, this townhouse accommodation is close to Palais des Congres, Church of St Nicolas, and Aquarev Park. Regional attractions also include Chateau de Rohan. How Much is a Hotel Room in Loudeac? Hotels in Loudeac start at $61 per night. Prices and availability subject to change. Additional terms may apply. For those wanderers that are hoping to find a place to hang their hat close to where it all happens in Loudeac, Travelocity's booking page lists a few good options. There are 2 apartments and hotels on Travelocity within a 6-mile (10-kilometer) distance of the center of Loudeac. The Brit Hotel Les Voyageurs is a sought-after Travelocity-listed lodging choice thanks to the fact that it is so close to the center of Loudeac. Investigate the Domaine de la Ferrière along with the Hôtel de l'Europe. The Domaine de la Ferrière is located only 17 miles (27 kilometers) from central Loudeac. The Hôtel de l'Europe, is situated 12 miles (20 kilometers) away. Two other hotel and apartment options in this area include the Brit Hotel Les Voyageurs along with the INTER-HOTEL Du Château. If time allows, adventurous travelers could see more of the Brittany region. Brittany is known for beaches, and common places of interest include castles. Sporty visitors might enjoy mountain biking and cycling here. Ile-de-Brehat is 50 miles (77 kilometers) to the north of Loudeac and is home to Paon Lighthouse and Guerzido Beach. Should you wish to spend a few nights in Ile-de-Brehat, check out the rooms at the Best Western Plus Les Terrasses De Brehat and Le Relais de Launay. For another option, head to Guingamp, 30 miles (52 kilometers) northwest of Loudeac, where you'll find the Brit Hotel Armor and Interhotel De L Arrivee. Regardless of whether you're passing through or spending a few nights in Guingamp, set aside some time to explore the Public Garden and Ancienne Prison. Prior to leaving Cotes d'Armor, be sure you watch some sport. Swing by Stade de la Route de Lorient, found to the east of Loudeac. Visitors who like the idea of booking accommodation in the neighborhood, book a room in the Novotel Spa Rennes Centre Gare or Hôtels LeCoq-Gadby. Lorient - South Brittany Airport is located 45 miles (69 kilometers) from the center of Loudeac. Wise travelers who wish to find accommodation nearby can easily secure a convenient option in the Hôtel - Restaurant Les Astéries or the Maison d'hôtes Joliot Curie.